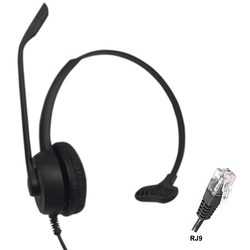 Providing you the best range of aria 18n rj9 monaural headset, aria 11n binaural call center headset and aria 18n noise cancelling headset with effective & timely delivery. Aria 18N Monaural Headset is single ear wearing headset specially designed for both office and call center environment. The headset consists of single earpiece and microphone. Apart from this, Aria Telecom provides various range of noise cancellation headset with various connecting cords. · Best use for call centers, offices, voice chat, web chat etc. Aria’s cheapest call center headsets specially designed for offices and call center environment. We are providing various range of binaural and monaural call center headsets. Aria’s best quality and light weighted call center communication headset that meets all the demands of phone intensive environments. The headset is featured with noise cancelling microphone so that your voice is easily understood without having disturbance.